Today, let us tackle one of the actions we humans do to our beloved pets. Do you pat your dog's head? Does he move away when you do so? According to Dr. Bruce Fogel and the Faculty of the Cummings School of Veterinary Medicine at Tufts University, patting or stroking the head is an action perceived by dogs as dominance and not affection. Other forms of establishing dominance to your dog is by staring at him, standing over him, or stroking the top of his head. Simply said, stroking the head is just plain uncomfortable to them. So don't be surprised if the dog will move away when you start raising your hand towards its head- especially if you haven't done the "nose swat". Patting the dog's head is an excellent way of asserting your pack leader position. If you have a naturally submissive dog, this action can possibly make him more insecure. So what's the best way to show your loving touch? Most dogs prefer being stroked. Although Peanuts just loves being patted in the tummy. Ingrate! Is that how you thank me for giving you more airtime? yes, i looked this up when yuki was a puppy. she used to do this but now will stay still. rocket still moves away when i try to stroke his head. i read that eventually they just let you do it and just tolerate it, even though they don't like it. both yuki's and rocket's favorite place to be scratched is their necks, right underneath their collar. they both get this look on their faces like it's the best thing ever. yuki will even lean into the scratch to get a deeper scratching, lol. Oh yeah, I've seen that look. Do they also do the blinky thing? The one where they get into this kind of trance and they start getting sleepy when you scratch their necks? Another interesting behaviour: When you pat a dog on the side, they normally prefer if you don't reach across their back and pat their opposite side... Lots of people tend to pat dogs up against their legs, and many dogs (quietly) object and have more happy body language when patted respectfully on the side closest to the patter. I know what you mean. Peanuts is starting to hate being patted near the tail area. Although she is starting to do the playful bite whenever I do that, eventually I'm pretty sure she'll become more physical with her disagreement. That's okay. I really wanted to see it. And please give my deepest gratitude to Leigh for taking the effort to upload it in youtube. I'll check it out tomorrow. I haven't done much blogging this two days. Fred and Gloria both love to be patted on the head. I guess it must depend on the dog! Maybe because they just love their mommy ^_^. Peanuts love being stroked on the head. But sometimes she still shies away when my hand starts to reach out. I don't think Indiana has a preference. He just always wants attention. I'm not surprised. Ginger doesn't mind being patted on the head either. I suppose it also in the way we treat them. I still can't train Peanuts effectively without the treats. I'm hoping we could eventually do without those. She still has a short attention span. Thanks. I'm happy you liked it. We also forget to consider the body language of the pat initiator which may probably have an effect on how the dog foresees the patting. Wow, that is very interesting. But now that you mention it, I do enjoy getting my tummy and the top of my chest stroked, more so the chest and the rump. Not so much the head. Cool! 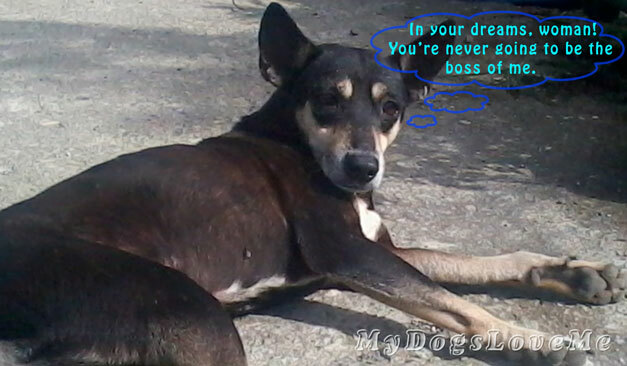 Hi Gracie, the tummy is like a default for almost all dogs, even street dogs here, as long as they allow you to pet them. Anyway, let me get back to everyone else tomorrow. I had this massive headache and had slept half of the entire day... literally. Have a good Sunday, everyone!!! Great information in the post! Wow! that's interesting! Not being really expert on dogs, I have always thought they liked being stroked on the head! Will have to pay more attention in future!!! hmm... desmond really is quite a specimen, as he seems to rather enjoy all forms of head rubbing and stroking and scratching. he often presents his head to us. We White Dogs like when momma cradles the side of our face as she massages the base of our ear...and of course body strokes (only I like belly rubs, the others not so much). BECAUSE YOU ARE FROM TURKEY ! !